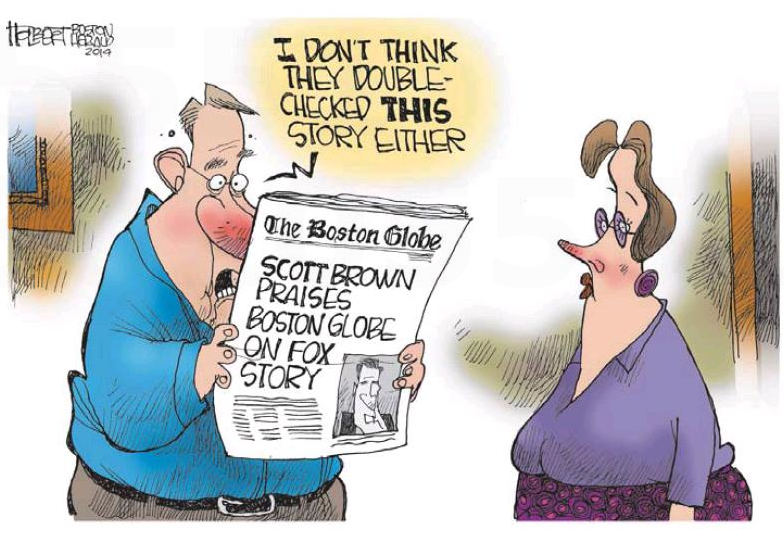 As the hardreading staff has said on several occasions, not only is Boston blessed with two daily newspapers, but both dailies are blessed with talented editorial cartoonists – Dan Wasserman at the Globe and Jerry Holbert at the Herald. Unfortunately, editorial cartoonists are fast becoming an endangered species. So . . . back to the present. In today’s edition of the feisty local tabloid Holbert has this followup to yesterday’s Globe/Herald/Scott Brown slapfight over his status as a Fox Newshound. For the record, Brown has re-upped with Fox News. And, as far as we know, has nothing nice to say about the Globe. But more important: Want a piece of this, Mr. Wasserman? This entry was posted on Friday, February 21st, 2014 at 4:57 pm and is filed under Uncategorized. You can follow any responses to this entry through the RSS 2.0 feed. You can leave a response, or trackback from your own site. As always Jerry Holbert is just hilarious!